UDM Downloads > MP3 M4R Converter! MP3 M4R Converter converts MP3 to M4R and M4R to MP3. The M4R is ringtone file used by iPhone. With the MP3 M4R Converter, you could create your own ringtone for your iPhone. The software is an all in one audio converter that supports more than 100 audio and video file formats. And, it converts files and keeps ID3 tag when converting. You could convert formats between audio files, for example, convert MP3 to M4R, convert WAV to MP3. It is also possible to convert video file to audio format, for example, convert AVI to MP3, convert MP4 to MP3. And, you could change encoding parameters of target files such as sample frequency, bit rate, channels, and quality. So it is possible to customize sound file size and sound quality. MP3 M4R Converter supports ID3 tag. You could enable it to add or keep ID3 tag when converting files. You could change volume when converting either. 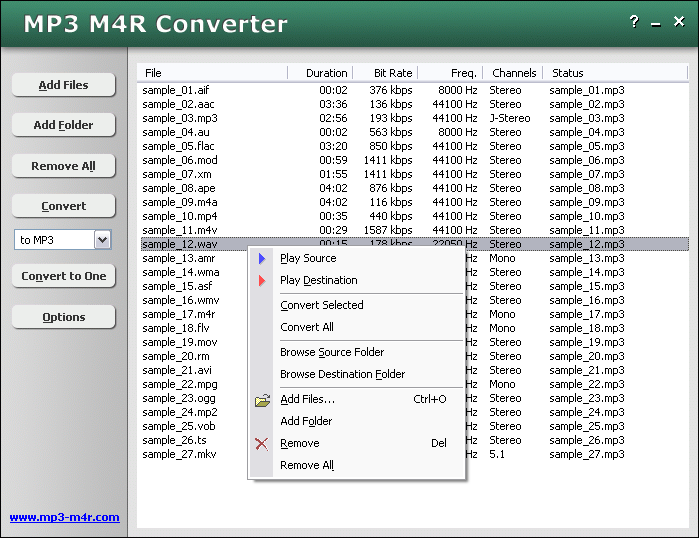 MP3 M4R Converter supports batch conversion. You could convert bulk of files at a time. And, the software is full compatible with Vista and Windows 7.